It might be surprising, but this rickety trailer was actually purpose-built for use with the RSO (with or without the Flak). Drawings can be found in , and pictures can be found here. Note that in the pictures in the link a trailer carrying two slightly different Flak types can be seen. The box is made of sturdy cardboard, but loses its form and integrity when the lid is open and is thus no good for keeping your parts together. As an aside, it is surprising that a German company didn't manage to spell "Flak" correctly. 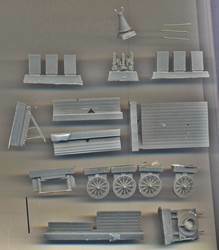 Most parts are resin, but a metal axle and brass gun barrels are given. Two of the brass barrels have slanted muzzles; Schatton just took a regular barrel and filed it at an angle. Unfortunately one of the slanted barrels has a muzzle where the opening is not deep enough and because of the filing any opening was lost. You will see below that I solved this by filing the unmodified barrel to match the slanted barrel and by using a (slightly different) 20mm barrel from the spares box for the middle gun. Note that the conical flash suppressors are actually not very representative of the real thing and it might actually be a better plan to use hypodermic needles instead. 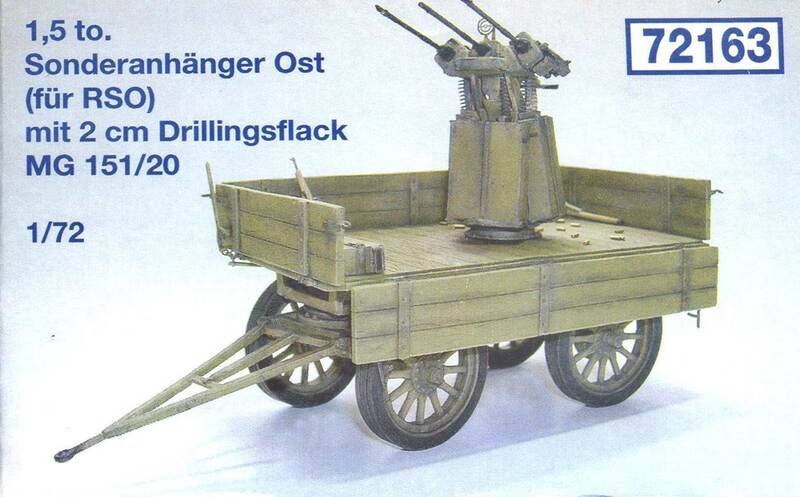 Schatton must have some sort of co-operation going with CMK, as the Drilling body and ammo boxes are the same as in the CMK conversion set for the Sd.Kfz.251/21. The pedestal is slightly different and while CMK has resin gun barrels, Schatton has brass barrels. You get six ammo boxes, while you only need three, strictly speaking. Note that the empty shells, ammo belts, gun sight, rifle and Panzerfaust shown on the boxtop are not given. More about that later. None given. Instructions are not really needed, as you can manage by looking at the box art. If you do so, you will note that the folded down side on the box is a bit odd. It is folded down showing the metal stiffeners, which the kit parts only have on one side. These would then have been on the inside when the side was up, just like we see on the right and rear side. The front side has the stiffeners on the outside. I am not sure if this is correct. I started construction with the cargo bed and soon discovered that I had been onto something when I looked at the folding sides on the boxtop. It turned out that you can't build the kit as it is shown on the boxtop and for various reasons. First of all, the side panels have a recess that will make you want to install them with the stiffeners outwards. Then you will also notice that the side panels are identical but not symmetrical, meaning that the left and right side of your trailer are interchangeable and thus will look different once installed. After that you will discover that the front and rear panel are not of the same height and thus different from the parts on the boxtop. Judging from my references, the largest panel should go in front. And then it dawned upon me: the picture on the boxtop is that of Schatton's 1/35 kit (Ref 3559). The wooden body went together without any real trouble; I just scribed the panel lines at the sides and the wood texture to enhance the overall detail. Having a look at how the suspension would need to be assembled I was left clueless regarding the rear axle mounting. As I decided to scratchbuild a completely new rear suspension it was a small step to do the same for the front suspension. It didn't look well aligned and in this way the front and rear suspension would at least match their appearance. (Not that they would match the appearance of the real thing, but that's another matter.) Construction was done using leaf springs from the spares box and various lengths of Evergreen material. As mentioned above, I filed the muzzle of one of the Schatton barrels to have a slanting business end and replaced the middle gun. There is no positive attachment for the guns. Drilling (pun intended) out the body to accept them is not difficult. I added short barrel sleeves just for the heck of it. Ammo belts came from the spare's box (source forgotten) and are actually too small for the calibre of the guns. 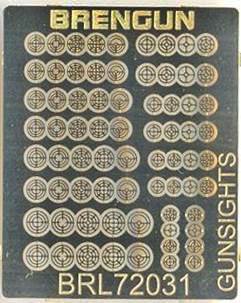 A ring sight came from Brengun. Note that I mistakenly have the ammo belts come out of the side of the boxes, while they should come out of the top. As there is no opening in the boxes here, I should have scratchbuilt this detail, but it's too late now. I should also have added the retaining straps that run vertically along the boxes. 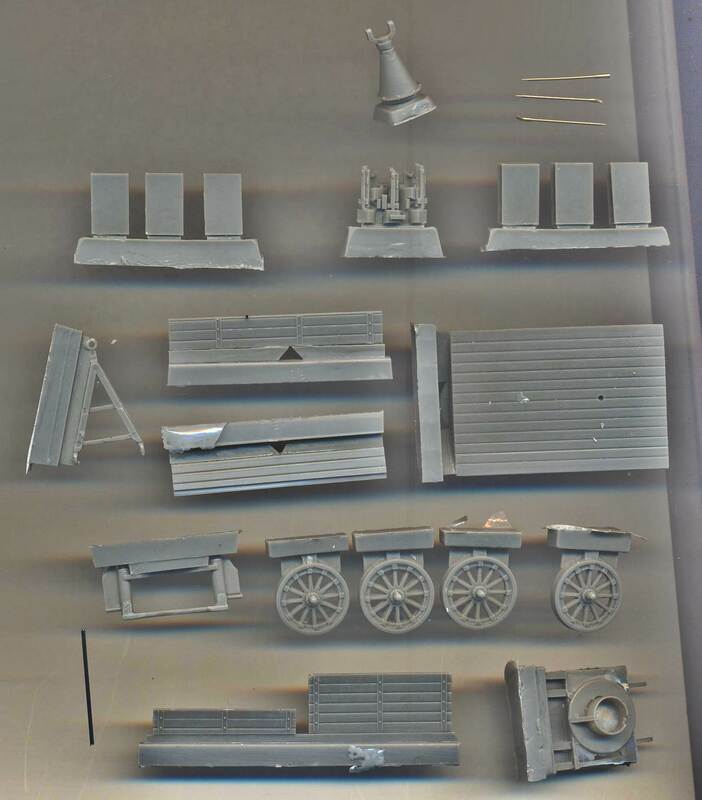 Note that in the pictures the small caps on the axles still need to be (re)painted. Painting them was futile as due to handling I kept rubbing off the paint.